You are here: Home / Current Projects / THANK YOU! 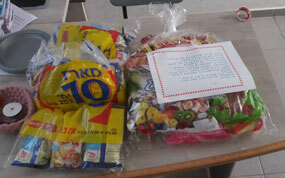 There are many people in Sderot that live in poverty. For the parents it is hard when they cannot provide the thing for their children that others parents are able to provide especially when it comes to their children’s Bar or Bat Mitzvahs. If you’re a boy in Israel, in the “Cycles of Life”, your Bar Mitzvah is second only to your wedding day and the same is hold true for your Bat Mitzvah if you are a girl. Each year the community gets together and hosts a Bar Mitzvah and a Bat Mitzvah for the children of Sderot who cannot afford to have one. 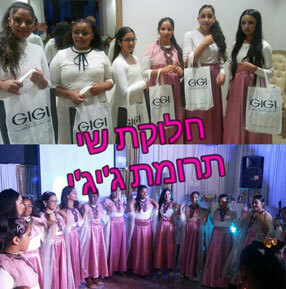 This year there were 14 girls who shared their Bat Mitzvah together for this special occasion. As in the past we were asked if we could help and thank to our donors, as in the past, we were able to take part in this year’s Bat Mitzvah. The tables were set, the food prepared, a table with gifts for the young ladies and in came the fourteen young ladies in their new dresses. It was a wonderful night of music, food and gifts; a night these young ladies will never forget. We understand the “Thank You” we received is not our it belongs to YOU our donors. From them and us THANK YOU! 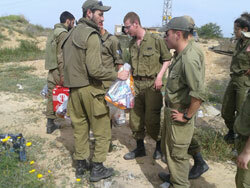 Living in Sderot the reality of a terrorist attack at any moment is very much a reality. We are fortunate to have stationed just on the edge of town in an empty field, an “Iron Dome” battery. Sometimes we forget that they are stationed out in a dirt field protecting us both day and night. Yet it is these young men and woman; well really they are just kids ranging in age from 18 – 24 that bring us a great sense of security just knowing their there. Well, to show our appreciation to these young men and woman we made a trip out to them. In the back of the car was Pizza, drinks and some snacks to try to make their home away from home a little bit more like home. They are always so appreciative for what we bring them and yet it is us who are appreciative for their service to the people of Sderot. Like I said, just knowing that these solders/ kids are out there 24/7 protecting us is a huge comfort. There is a school that we have been providing sandwich making to for the past three years. It is a joy to be a part of helping children that come to school in the morning hungry can get something to eat to fuel their bodies to learn. As the school year was wrapping up we wanted to make the last day of school special for the kids. It took us two day to package up all the candy and deliver it to their classrooms before they came to school; the boys side one day and the girls side the next day. I remember as a child my mom sending cookies or cupcakes to school with me on the last day and in as much as some of these kids come to school hungry, having their parents doing the same as my mom did was not an option.